The following information was compiled by Retired Lieutenant Rick Westfall. There have been numerous sheriffs and deputy sheriffs in Kanawha County. Many of those date back to the formation of the county in 1788 and continue to the end of the Civil War. These officers of the law were elected to serve the entire county, not just the city. The first evidence that I find of an organized Police Force in Charleston is after the Civil War. Records survive that tell of a city police force and some of its members prior to and during the war. The organized Police Force did not operate under a specific set of rules until 1873. There are several notations in the Common Council records that indicate an individual was paid for his services as a policeman before the ordinance of April 1873. The going rate for a police officer of the 1860's and early 1870's in Charleston was $1.00 per day or $30.00 per month. This salary does not appear to be much, but according to Council records, teachers at Union School made just over a dollar a day. Union school, the first of many city-supported schools, was built on State Street (now Lee Street just west of Court Street) in 1870. At a Common Council meeting held March 21, 1873, discussions were held in an attempt to obtain uniforms for the city police force. These discussions were sent to a committee, and such as it is today, the committee did not bring this resolution back to the floor of Council, but instead referred it to the City Sergeant for consideration. At a regular session of the Common Council on April 16, 1873 an ordinance was passed that has been added to and taken away from over the years. The ordinance was titled rules and regulations of the City Police. The ordinance leaves little doubt that this is where the Charleston Police Department was born. The ordinance, with its misspellings and errors in punctuation, is presented in its entirety just as it was written more than 125 years ago. April 16th 1873 On Motion the following Ordinances were passed. An ordinance by the Council of the City of Charleston from and after the 1st day of May 1873. The Police force of the City of Charleston shall consist of not less than six men beside the Chief of Police. This number may be added to from time to time as the council Shall direct and all of said force to be appointed by the council, except the Chief who is elected by the people and removed by them at their will and pleasure or by order of the Mayor. The said force shall be governed by the following regulations and such others as may from time to time be added thereto by Council. The Chief of Police shall be subject to the instructions of the mayor of the City and shall obey his directions in all matters relating to the keeping of the peace and order within the City in accordance with rules herein after prescribed. The members of the Police force shall receive and obey all orders from the Chief of Police or Mayor, promptly. No member of said force shall while on duty sit down on the streets or enter any house, store, or any other building except in the exercise of his duty or called thereto by some person or persons requiring his services as a police officer. Nor shall any member of such force stop on the streets to talk while on duty or engage in any conversation except it become necessary in the discharge of his duty, or to give information to those desiring it, and this he shall do at all times in a polite manner and render any assistance to those requiring it which is not inconsistent with his duty. No Policeman shall abuse or harshly treat any prisoner whom he may have in his charge unless necessary so to do in self defense, or to prevent their escape. Any Policeman found drunk on duty, shall be immediately discharged by the Chief, or if found drunk more than twice off duty while in the employ of the City, or within six months maybe discharged by the Mayor. Whenever any Policeman hears a signal of another Policeman he shall immediately answer such signal in accordance with the secret signal rule to be laid down by the Chief of Police and such code of signals shall not be revealed or betrayed by members of this force. All Policemen appointed for any particular occasion shall be under the control of the regular policeman of the beat in which they are assigned to service, he of course being under the direction of the Chief. No Police officer shall allow any crowd of persons to gather on the streets, about any corner or elsewhere so as to obstruct the free passage of foot passengers or teams, nor shall he allow any nuisance to be committed or allowed to remain on the streets but shall report to the proper Officer at once. It shall be the duty of the policeman whenever or wherever they know by sight or reliable information from others of any ordinance of the City, or of the State being or about to be violated to immediately exercise all his powers and authority to prevent such violation, or if accomplished to arrest the parties engaged therein. This Section applies to all Ordinances of the City, but particularly to the enforcement of the Liquor law of the State and the City Ordinance in regard to Gaming Houses, & Gambling, unknown word, (could be fast racing) Immorality, measuring or weighing coal and unlawful occupying of the sidewalks, and also when on duty to preserve the peace of the City. Secure the inhabitants thereof from personal violence, and their property from fire or unlawful depredations, and to secure these ends, they are individually and collectively empowered with authority immediately to arrest upon sight and without warrant any person or persons found Violating any Ordinance madepursuant to these ends. Where there are private Watchman appointed or paid by private Citizens for the protection of their own premises or property they shall after being properly Sworn in, be Empowered with like authority with the other police and shall be under the control and direction of the Chief of Police except that they may not by him be removed from the prescribed beat for which they are employed and may by consent of the Chief assume and wear the prescribed uniform of the City Police. The place of confinement of all prisoners arrested by the Police shall be the County Jail, unless otherwise ordered by the Mayor and shall be brought to trial as soon as possible. The Police Shall receive such compensation as shall be prescribed by the Council, and all uniforms ordered in accordance with section 3 of this ordinance shall be furnished by the City, but charged to each policeman and deducted from their regular pay in equal sums so that it shall al be paid for in four months, but no such officer in case of discharge shall be allowed to wear any part of the uniform after such discharge but the City may take Such parts of it from him by paying him a reasonable amount therefor according to the condition thereof. Each officer shall give immediate alarm in case of fire by crying " Fire" repeatedly and by ringing any of the Bells to which he may have access particularly that of the Court House, and during the progress of such fire or any other public excitement be especially watchful for thieves and incendiances and shall arrest all Suspicious persons. All Such officers shall take the following oath before entering upon their duties. I "A B" do solemnly swear that I will Support the Constitution of the United States and of this State and will faithfully perform the duties of a Policeman in the City of Charleston and obey all orders received from the proper officers if within my power, and also comply with all requirements of the Police Laws of the City. The hours of duty Shall be Six hours on duty and six hours off duty alternately under the direction of the Chief. And be it further ordained that the members of the City Council be Special Police officers without pay, with power to do all that the regular Police may do or to delegate that power to another by Transfer of his badge for the preservation of the peace, (unknown word) good order of the City, in accordance with the forgoing ordinance. This ordinance remained in effect until it was amended in January of 1880. The body of the new ordinance continued to read much as the 1873 ordinance. One major change to the ordinance is contained under section 1. This change allowed the council to reduce the force to not less than two men and no more than four, not including the Chief. Section 1 in its new state also gave specific language saying that a police officer could be dismissed or suspended by the Mayor for dereliction or neglect, until the next meeting of the Council, when the Mayor was required to report the fact and grounds of the suspension. During the suspension the Mayor was to appoint someone to fill the vacancy. The Chief of Police, at the time the ordinance was adopted, was an elected official who was by law the Town Marshall or Chief of Police. Later the Mayor of the city was to become the Chief and still later the "Captain of Police" would become the Chief. By the early 1900’s the department had expanded to 25 officers, a Lieutenant, and an appointed Chief. The population of the city had risen to almost 20,000 citizens, this large increase in population occurred after the area west of the Elk River previously known as "Elk City" was incorporated into the city boundaries. Throughout the early 20th century the city as well as the department continued a steady, if not slower growth. More officers were added, a detective division was organized, still later a traffic unit became a reality. In 1937 officers became protected by Civil Service. This new coverage came with a benefits package that included retirement pay, and job security. Higher standards were set for the hiring of new officers, some being physical others being mental. A new application was developed, the "Good Ole Boy" system of being a policeman was apparently over. At the advent of the "new application" more than 500 men turned their applications in at City Hall. The force had started to move away from the old foot and mounted patrols, they were on motorcycles and in cars. They still used call boxes but some cars had one-way radios that would announce calls tell the cruisers to respond to an emergency or to call headquarters. 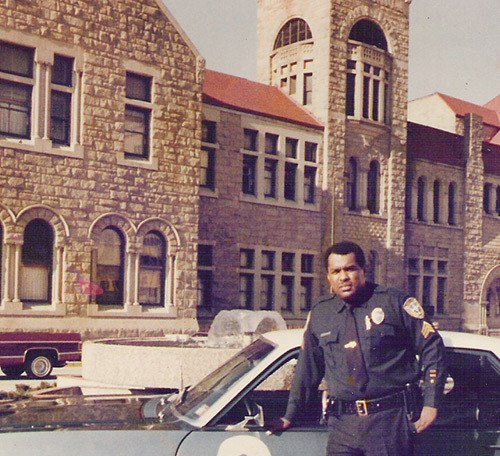 As the department moved through the 50’s and 60’s even more officers and divisions were added, a vice squad, accident cars, and a crime prevention unit, two-way radios were common place. The 70’s brought federal monies and new programs to the department, more officers, and the hiring of the first sworn female officer, new state of the art equipment, such as, radar for the apprehension of speeders. With the advent of dangerous drugs in our community the Vice Unit was split and a Drug Unit was formed. This unit was the predecessor of today’s highly publicized Metro Drug Enforcement Unit. The 80’s and 90’s have been even better for all involved with the Charleston Police Department. From our humble beginnings the department has grown to an authorized strength of 161 sworn officers, and 50 civilian employees. These employees police an area approximately 33 square miles. The population of the Capitol City swells to over 200,000 on any given day. The department revolves around a Patrol Division that has four shifts working 12 hours a day. Each shift has 12 beat cars, 3 Sergeants and a Lieutenant. The officers of this division are supported by a Criminal Investigation Unit, a Metro Drug Enforcement Unit, Bicycle Unit, Street Crimes Unit, Records Division, Professional Standards Unit, Information Services Division, a Training Division, Grants Section and Community Services Division. The department utilizes Mobile Data Terminals to complete incident reports and to run criminal queries. As well an Automated Fingerprint System is utilized to book arrestees.